Are you wanting to create social video? 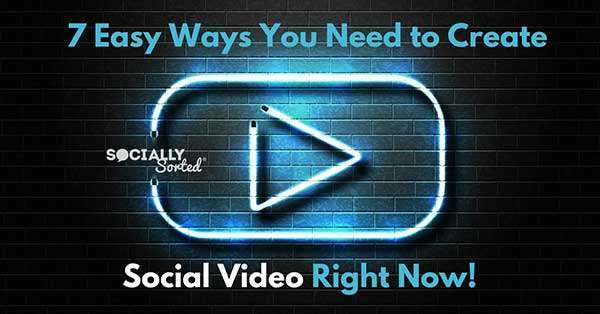 Social Video is HOT right now, so I have a few tips for you that will help you to easily get more out of your social video. In this post I share 7 easy ways you can create social video for better results on social media.. so you can get started right now! Native video on Facebook, Instagram Stories, LinkedIn video.. there are so many ways to use video on social media (social video!) for results! We wrote about social video and some great tips from an infographic by Animoto recently. But I was excited to hear that they have followed it up with a comprehensive report that really sheds the light on social video and how you can leverage it really well for your business. You can Download the FREE Report here. 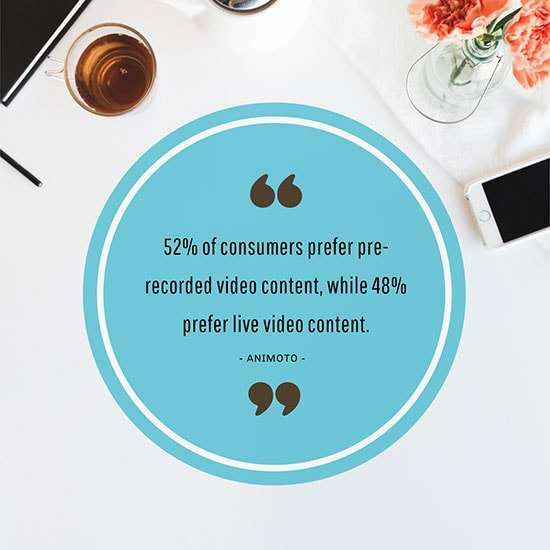 I couldn’t resist going back to rewrite some of this post and highlight some of Animoto’s findings after they surveyed 500 marketers and 1000 consumers (real customers) to find out how social video is being created and watched. Consider it your “unfair advantage” when it comes to creating social video. So, with new “intel” in hand from Animoto to go with this post, let’s dive into my 7 super easy tips for you to create social video with ease (and get more engagement, shares and traffic). There’s one thing I’m sure you’ve noticed: Native video is everywhere. Facebook loves native video and gives it a push in the newsfeed. You can upload a quick video to Twitter or go live via Twitter’s Periscope. There’s even a new Native video function on LinkedIn. 83% of consumers would create more video if they had more time, resources and budget – Buffer. Stop worrying about creating highly edited YouTube video, and start with easy-to-create social video. Choose the platform where you are most comfortable and where your audience is hanging out. A quick announcement video on Twitter. Start out small and get confident with it. You don’t have to go live, just record the video and upload it. Practice makes perfect and the more you do it, the more confident you will become. Let’s talk about real estate. On a newsfeed, you want a lot of it, right? I mean you want your content to stay visible as much as possible. So here’s how you do that. You go square. 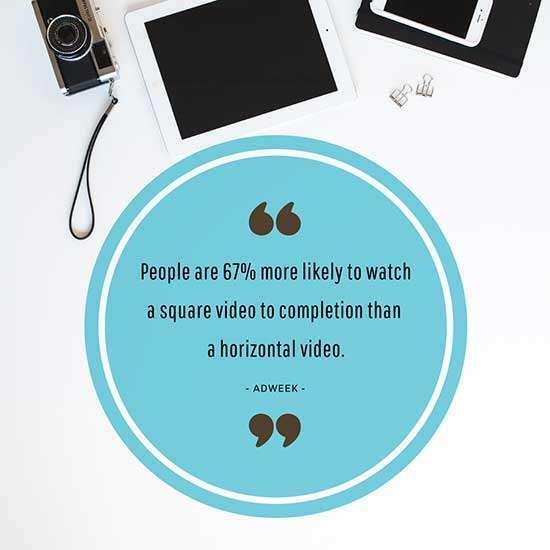 Square video is super popular and it takes up more of the newsfeed than traditional landscape video, so it catches more eyeballs. It also posts well to Instagram, Facebook and Twitter. We are so used to square format now, that it’s accepted as one of the best ways to view video. Check them all out in this post. Whatever the tool, start using it! We have NEVER had such amazing (easy-to-use) tools at our disposal. Don’t forget to post your videos to more than one platform that suits “square”. Already posted it to Facebook? Wait a few days or a week and post it to Instagram. Maybe add it to Twitter too! Repurpose your video on to YouTube if you haven’t posted it there. If you want to get fancy, repurpose it for landscape/optimize it for YouTube with backgrounds and captions. Be sure to add a “Call to Action” at the end of the video or in your caption or description. If someone doesn’t make it to the end of the video, then they can still see the link you have included. Often we focus so much on the images that we forget how vital the captions are. And they are vital – they are a huge part of storytelling. I was recently speaking at Content Marketing World in the US, and in my sessions I highlighted the importance of captions in the storytelling. Find out more about that here in this post. Longer descriptions work well on Instagram (you can go into full storytelling mode with longer captions). Shorter captions suit Facebook. Experiment with it! Think of your captions like “added context” on Instagram. You can add more information, share behind the scenes, give some background. It’s perfectly acceptable to provide most of the information in the caption itself, so there is no need for your followers to click away to another profile or page. I know, I know, I just said “Go Square” but there is room for both Square and Vertical in this town! And they are both working really well right now. It’s not so much about which is best but about the orientation of phones. 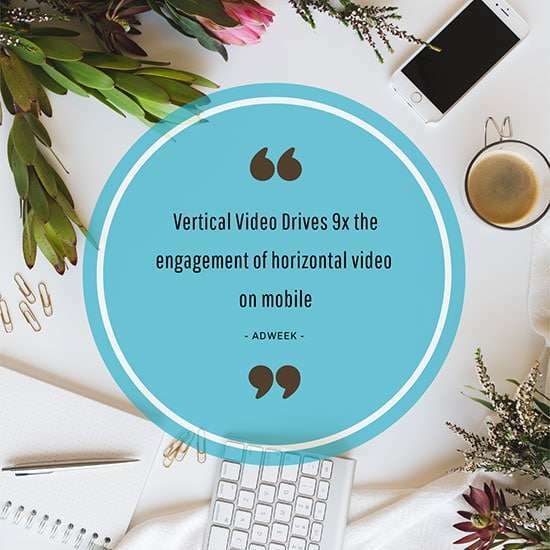 We live in a mobile world and the reality is that most people are viewing video on their mobile phone in vertical orientation. So …as much as square video suits Instagram, Twitter and Facebook, vertical video has its place too. Play with Instagram Stories. They feature vertical video. It’s how we hold our phones, and it’s a great place to get familiar with using vertical video format. Snapchat Stories use verical video format. If your audience is on Snapchat then this is a good place to start. Try vertical Facebook Stories. If you are more comfortable with Facebook then this is a good place to try vertical video. My advice? Mix it up between vertical and square. Most businesses on social media would be across two platforms. For example, creating Instagram Stories in vertical mode while creating Square Videos for Instagram and/or Facebook. In the report I mentioned above by Animoto, they reveal some fascinating stats about the type of content our audiences are craving for. And one of the most popular types of content that they want to see from brands is: Humor! Think shareable funny content. What type of content do YOU like to view and share on Facebook? How can you bring some of this into the content you share. It could be funny photos, memes or funny videos. Experiment with GIFs. How can you share your brand voice in funny ways with GIFs. Tourism Queensland did this by making an entire channel of GIFs using videos of Australian Animals. It’s on brand, it’s funny and it’s interactive – their audience can access the channel and share the GIFs too, which is clever branding. Not everyone is the funny class clown and not every brand can be naturally funny. It might not be your style. The good news is that you don’t have to. Animoto spill the beans on WHAT type of video consumers love to watch in their report. Guess what? A lot of what they share in their report is all about how we love authentic content. We love to see you being you, to see the behind the scenes of your business, meet your staff, hear their stories and be a “fly on the wall”, as we say in Australia. Start by being yourself. Tell your story, give tips, share your knowledge. Only you can be you. Share behind the scenes content about your business. Share how you created something, what your processes are, maybe a fun story about your team. We like to peek behind the curtains. If you don’t like to be “on camera” start by facing the camera away from you. Take us on a tour. Do an unboxing of a new product. Interview a team member or customer who DOES like to be on camera. Animoto shares way more insider tips but these will get you started. Ok so this may sound a little controversial, with all the “go live, go live” ranting that happens online, but it’s true! I’ve posted about this before. The fact is that we are divided as to what type of video we like. For whatever reason… time, personal preference, our our boss watching… we can’t all watch live video, all of the time (or we simply don’t prefer it). Some of us actually prefer pre-recorded video. In fact according to Animoto, 52% of consumers prefer pre-recorded video content, while 48% prefer live video content. And of course… vice versa. Some people LOVE live video. Either way, just start with SOME video. 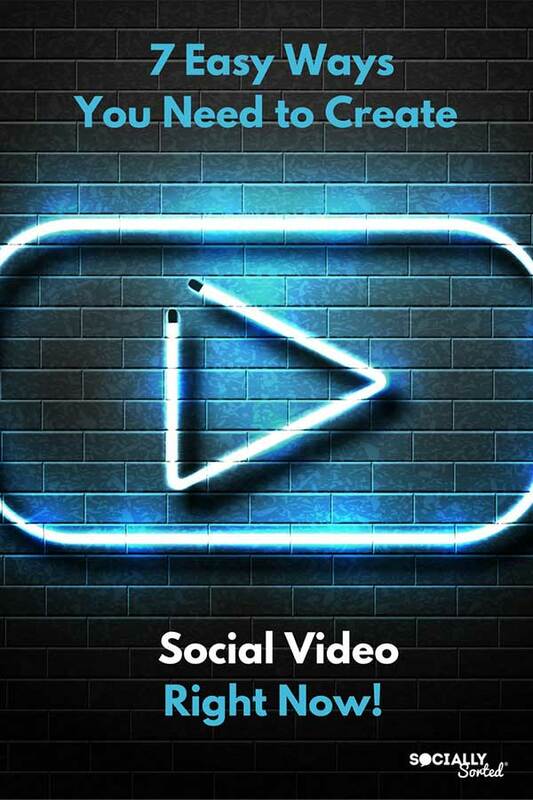 Social video is a great place to start. Stop stressing if you are not going “live”. Chances are that half of your audience doesn’t care if you do. We still want to watch video, but you can pull back on the “gotta-go-live-turbo” because half of us don’t care. Of course, you can do both, but lighten up. Nobody will cry if you choose one over the other. If you want the FULL intel on all the stats and tips I have shared in this post, then be sure to grab Animoto’s full report on the State of Social Video. It’s almost like having an unfair advantage. Which of these tips have you used? Which of these will you start using now? This post contains affiliate links and I will receive a commission if you make a a purchase after clicking on one of thse links. Please know that I only recommend tools that I use and love as I want you to be in good hands!